Hosting a race as a fundraiser is a fantastic way to raise money. Many organizations do so all throughout the year. Runners love that their money is going to a worthy cause, not just to block off the streets. However, did you know that the average 5K costs $900 to put on? That means if the race brings in $1000 they’ve only raised $100. This year, Prairie Fire has partnered with “Meg’s Team” to help worthy causes raise funds without all the headache of hosting a single event. 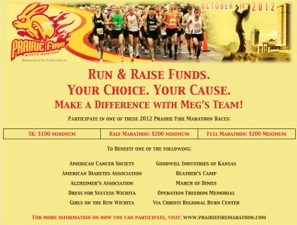 These organizations will be using the Prairie Fire races as their event. Read more from Meg Sytnick about how you can put more purpose behind your Prairie Fire Marathon this year. healthy and help a cause. like my hands are tied when a friend or family member is battling for their lives. endurance events, that I can give back in so many ways. gear and best of all, a charitable contribution to your favorite cause.